This climactic finale to the mini-series manages to combine enough for readers' hearts and heads, with also some pure sensation and bursts of colour that serve to enliven any given panel. The Doctor gets to have a lot of morally sound commentary on the actions of the misguided Unon and show his deep concern for the all but extinct and forever distorted Lect. Plenty of material of note also features for Rose Tyler and Jack Harkness. Rose has had to absorb a lot of alien planet history in a relatively short period of time and feels a bond for the half-crippled Lect, who now rely on battle 'tanks' and barely resemble the scientists and artists that occupied their now-destroyed home world. Jack is separated from the Doctor and Rose, and faces the prospect of an eternal limbo. But whilst captured he manages to realise that while the Unon have done some monstrous things, not all of them are irredeemably 'bad'. The shades of grey that war is inherently all about is a strong theme, and that theme is effectively explored in this epic. It is also as relevant as ever in our own society in the 21st century. The title of the story misquotes a frequent headline that cropped up during the early part of the last decade, and that phrase still resonates and still has foreboding meaning now. Although the Lect would seem to have the more just cause, there is no dispute over their having a 'bull in a china shop' manner. By using such formidable war machine shells they have roamed parts of space and operated in a way that has shaken those with less battle-minded priorities, who may be present. The Unon may have a didactic and sanctimonious leader in Arnora, but still her intentions in shaping the universe have some substance and grounding. Satisfyingly, we see the Doctor decide to ultimately let the war 'resolve itself', although some help from Captain Jack ensures the Time Lord does not get cut down as a result of being somewhat passive this time round. It is reasonable for the Doctor to be an observer, as this war was not really his doing on a fundamental level. Important figures on both sides of the battle die, but ultimately a peaceful solution does present itself, with a little help coming in the form of the Doctor's ship. I have not discussed covers in any detail in any of my prior comic reviews for this site, but would like to on this occasion. Most of the ones used for this now-concluded mini-series look at least eye-catching if not mesmerising; my personal favourites being issues Three and One. Somewhat disappointingly this fifth issue bucks the quality trend in its choice of the main cover, which effectively acts as a close zoom at our heroic trio. And as regards reflection on the miniseries as a whole and how each individual 'fifth' stands up: Issue Four perhaps was the highpoint of the run. It certainly had both incident and plot development but also gave the art team a free rein at showing their skill and ability to present such wonderfully 'out there' concepts. This issue is almost a bit more closed, (if also focused), and evokes the early issues again. But having a clear ending to the story which seems organic and fitting is a good quality. Also, readers that committed to this long-running story do have their patience rewarded now, and indeed in the near future. Several times this year Christopher Ecclestone showed his typical warmth and generosity - when the main spotlight and cameras are engaged elsewhere - of reprising the Ninth Doctor for respectively an engaged couple, and later a poorly fan of the show. Of course the chances of his ever coming back on-screen for a proper new story are as sparse as that of Paul McGann being entrusted with a fully fledged TV spin off. But clearly the readership and the critics think that the character that succeeds the worn "a bit thin" War Doctor deserves as many extra stops in his travels as can be made possible. 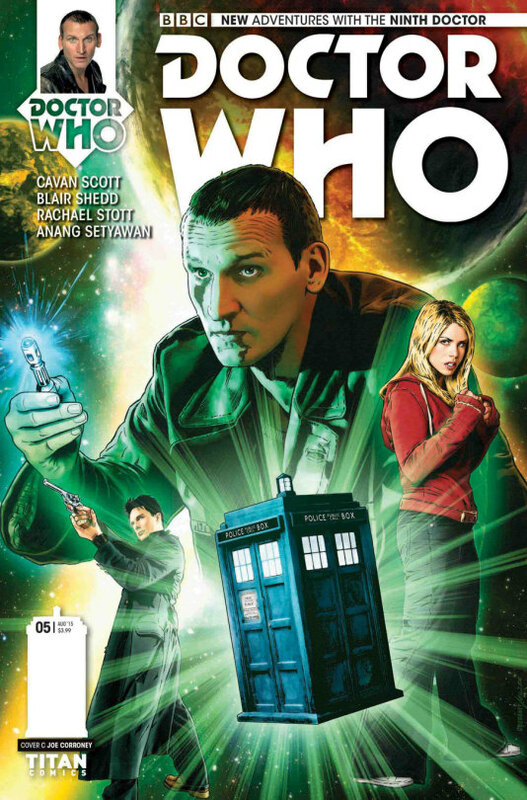 As much as this publication is a decisive end to a story that began quite some time ago now, it is in fact just the beginning as far as the Ninth Doctor comic book series goes. Cavan Scott will again be the writer, but will again other able artists on the endeavour; starting with Adriana Melo. I look forward keenly to a more flexible and experimental run from spring 2016 onwards that can utilise all manner of stand-alone, multi-part and arc-linked monthly editions. Once again some alternate covers are presented, in the absence of a humour mini-story. Gabby and her BFF try to hash out their differences, though Cindy still thinks her friend might be losing touch with reality. Cleo betrays the Doctor and blasts him with the device but instead of getting younger, John Smith starts retro regenerating. Fading starlet Dorothy Bell has been searching for the alien device for years but when she gets her hands on it things don’t go as expected. her. Nothing really grabbed me and I had to keep slogging through to the end. That’s where things finally started shaping up. Or rather, one specific character suddenly took a different shape. This issue was the exact opposite. From the very first page it’s off and running. Nick Abadzis gives us a fast and fun story that more than makes up for any previous short comings. It all starts with the Doctor's retro regeneration. The fountain of youth device doesn’t work as expected on a Time Lord and for a brief moment the 9th Doctor is the star of this 10th Doctor adventure. It lasts for just a few panels before the effects are reversed, but it was great to see nonetheless. The little touches like that are why comic books can sometimes exceed the limitations of television. There aren’t contracts and schedules to be worked out. If the story calls for the 9th Doctor for a few panels, it’s easy to make it happen. Some of the characterizations that I struggled with before have even managed to turn themselves around. Cleo went from being an irritant and nuisance to a central character that has proven herself to be more than just a thug. Though working with Erik Ulfricksson, who appears to be one of the bad guys, she isn’t his mindless servant and in fact stands up to him. There are some intriguing things going on with the pair that we aren’t privy to yet. Dorothy in a coma like state. And from deep within my dreamless slumber, a sleep like death, I heard your voice. You called to me. As with all good Doctor Who stories there is more going on than we first suspect. This isn’t just a story about a stolen artifact. What about the aliens that made it? We will find out more about them next issue. I will admit here that I am not really a fan of these bonus strips. The entire premise of them is that the Doctor is heartbroken over leaving Rose so he adopts a cat named Rose and then apparently hilarity ensues. I don’t have anything against the Doctor/Rose relationship, but these cartoons take the Doctor’s feelings to beyond parody. I rarely find them funny, at best mildly amusing. Except for this one. You see,it features K-9. Who doesn’t love that robotic dog? Rose the Cat decides that a good Sunday dinner is all the Doctor needs to get over Rose the human so the three of them go shop ing. K-9 loads the cart with everything they need and then the Doctor uses the contents of the cart to explain the concept of love. This one was actually really enjoyable. Sydney Cove becomes something more than just another tourist spot when a time portal deposits a very large pyramid all of a sudden, causing inconvenience for those wanting to use Port Jackson harbor. But furthermore beings from other worlds and time arrive with designs on the incongruous pyramid, such as notorious mobster Cyrrus Globb, Professor Horace Jaanson, and deadly female assassin Kik. Rival Professor Bernice Summerfield and some of her dearest friends throw one more spanner into the works, and likewise for a group of con-artists headed up by a most familiar gentleman who wants to be called 'Doc'. Eventually time and space stands to get more than a fleeting makeover, when the Ancients of the Universe are abruptly brought out of slumber. The Doctor's moniker of Time Lord will never have been put under as much scrutiny as this scenario dictates.. Despite Peter Capaldi's well-worn and wise appearance taking up much of the cover, this is very much an ensemble piece and at least as much a Bernice Summerfield story as a 12th Doctor one. For those only really familiar with contemporary TV Doctor Who, Bernice may come across as something of an unknown quantity, despite narratorLisa Bowerman's profile being reasonably high over recent years. And many other characters are returning from numerous other spin off stories as well. Gary Russell originally wanted River Song to feature in this story. Her exploratory and independent nature meant that when the author was not allowed to feature her, he opted for Bernice; possessing similarities in archaeologist/professor and just an all-round smart cookie. With so much (dis)continuity at work Russell chooses not to try and join the dots with every previous story featuring the main character, (e.g. the Eighth Doctor classic The Dying Days is glossed over). But there are certainly fun supporting characters, even if somewhat limited in their depth and purpose. Professor Summerfield gang include her very own son Peter - and definitely the most intriguing of the secondary characters - along with engaged couple Ruth and Jack (the latter being a red-eyed Kadeptian humanoid) and Keri who is a long time friend for Bernice. We also have some 'loveable rogues' in the Doctor's own temporary cohort, that comprise Legs (as the comic relief), Dog Boy (for muscle and weapons handling), Shortie, (who can plan details to a fine art), and Da Trowel, (who knows more than a thing or two about excavation across the cosmos). As stated, the Doctor himself is far from the dominant character, and takes a while to be utilised. It is worth paying heed to the fact that 'Big Bang' is one of a loose trilogy called The Glamour Chronicles. Hence the other stories have the tetchy Time Lord in a more traditionally focused role, and indeed can be read/listened to in any order. The dynamics that involve a given character against another one or group is one reason to keep listening through a 5-CD release with just the one -admittedly conscientious - performer in Lisa Bowerman. But as much as the dialogue and characterisation are quite enjoyable, there is also something of a muddled story here. The sense of threat is somehow too abstract, and come the conclusion a lot of the prior events do end up feeling incosequential. Also troublesome is that the story proper takes a real while to get going properly. Maybe Russell should have had some real incident happen first and then use characters' speeches (and flashbacks) to fill us in on the characters. He certainly has not broken his habit of referencing the past tales of Doctor Who, be they official televised ones or officially branded spin-off in nature. We even get a roll call of a good couple of dozen former companions, bringing to mind the retrospective nature of many a 1980s TV story, such as Resurrection of the Daleks. Fortunately one original Eleventh Doctor book I know -The Glamour Chase -gave me some appreciation for the overall plot and its resolution. There just about is enough explanation for newcomers, but I do really recommend looking to get at least a summary on this unique form of shielding which has appeared in other original Doctor Who fiction and even Big Finish audio. There is also a lack of any really good villain. Kik the Assassin and Globb are interestingly ruthless to an extent but ultimately a McGuffin is being sought and no dark scenario for the world/ universe feature directly in the antagonists' designs. Bowerman is a stellar audio actress, and many old-school fans will remember her very good performance as Cheetah Person Karra in Survival. She does a fine job as the narrator, is even better as Bernice (who she has played so much over the years) and does a nice enough imitation of the incumbent TV Doctor, who is in a rather subdued mood for much of the story. Other voices though are variable, and one character ends up sounding like the Spitting Image mock-up of Queen Elizabeth I, which is funny but a little too distracting for those of us who saw that late satirical show in the past. There is some good work in production terms with the sound effects matching the cataclysmic effects of the Ancients. Backing music is suitably subtle and non intrusive. As much as Murray Gold does a fine job on he TV it is good to have a very different style for audio books such as this. Overall success of Big Bang comes down to how much a listener is prepared for a story lacking urgency; most likely deliberately so in favour of whimsy and 'screwball' humour. This certainly is along the lines of Gareth Roberts 'missing Season 17' stories and has more than a touch of Douglas Adams' own work from outside of Doctor Who. It passes the time tolerably enough but is quite likely to prove forgettable as well. If confining the events of last month’s Torchwood: Fall to Earth to a single setting in the form of a crashing spaceship seemed like a bold move on the part of writer James Goss, then his successor Emma Reeves’ decision to have the majority of her first Torchwood audio drama, Forgotten Lives, take place within the grounds of a residence for the elderly might suggest to some that she’s bordering on insanity. There’s most certainly method to Reeves’ madness, though, since in removing the show’s most compelling two lead characters from their isolation in the Welsh countryside and having them venture into the Bryn Offa Nursing Home, she effectively ensures from the outset that listeners can expect a yarn quite unlike anything they’ve heard or witnessed in the series’ history. In case any of our readers hadn’t already heard or gleaned the information from the cover art, the beloved duo in question comprises of Eve Myles and Kai Owen, returning to voice Gwen Cooper and Rhys Williams respectively as the ever-ambitious couple attempt with great difficulty to balance their increasingly strained relationship with their child Anwen alongside their efforts to seclude themselves from the rest of the world after the events of Miracle Day, only to be drawn into a new mission after Myles’ justifiably distrusting character receives a mysterious phone call relating to a figure who claims to herald from her not-so-distant past. Sure, this could be construed as a less explosive means by which to thrust the pair back into action than was the case when governmental forces destroyed their household in Season Four, but given the lack of critical acclaim with which that run was met by overall, perhaps that’s for the best. Regardless, like Barrowman and David-Lloyd before them (and like Tracy-Anne Oberman in this month’s Torchwood release, One Rule, one would hope), neither Myles nor Owen appears to have any problem reviving the humility, the unyielding internal conflicts between duty and family, the dark yet somehow heart-warming humour and the universally empathetic yet oh-so-inherently Welsh romantic bond which made their constructs such an instantaneous hit with fans from the get-go in the original TV show. What’s more, whereas Barrowman’s Jack Harkness didn’t offer much in the way of surprises in The Conspiracy – one of the only minor faults with what’s still probably the range’s finest outing to date – Emma Reeves pays just as much attention as Goss to portraying both Gwen and Rhys in a wholly different light, partially by having them interact with Anwen – in a range of rather unique ways, we might add – on occasion and partially by exploring their relationship with Jack from an unprecedented angle that casts a refreshing new light on the extent to which the latter went to in the early years of the show in manipulating his friends to step once more unto the breach regardless of the danger involved with doing so. This noteworthy emphasis from Reeves on leaving a substantial impact upon the show’s characters extends also to the potential bearing the events of Forgotten Lives may have on Torchwood’s future at Big Finish; although after last month’s seemingly narratively inconsequential Fall to Earth, there’ll most likely be those starting to wonder whether the studio will employ a similar tactic to Steven Moffat in terms of plot arcs, structuring their seasons in such a manner that their major revelations only come into play during the penultimate or final instalments, yet quite to the contrary, any fans who elect to skip past this one for whatever reason might well come to quickly regret the move given how significantly the far-from-isolated tale presented here appears to overhaul the playing field for subsequent releases in the range. At the same time, the argument could be made that Reeves’ storyline quickly becomes so constrained by the need to further Season One’s overall arc that it’ll neither satisfy as a standalone listening experience or indeed be remembered for its own merits rather than as a cog in an admittedly increasingly promising machine. With any luck this flaw should be remedied with our trip back to 2005 in the Oberman-led One Rule, but it’s still a great shame that Forgotten Lives’ ambition in terms of taking Torchwood in a new direction not only for now but forevermore is as much a detrimental factor as it is a USP, even if the final few minutes are absolutely guaranteed to leave fans the world over absolutely chomping at the bit to see what’s next for Gwen in February’s More than Us. Let’s not get too bogged down with the release’s negative aspects, though, since as well as boasting the returns of Torchwood’s two most dedicated members, this largely accomplished third release moreover sports one hell of a fine supporting cast ensemble. From Philip Bond’s simultaneously charismatic and mournful take on enigmatic pensioner Mr Griffith to Sean Carlsen’s frantic yet believable portrayal as Gary, Bryn Offa’s head caretaker, to Emma Reeve’s own unexpected but similarly memorable cameos as both female resident Ceri and Nurse Bevan, each and every vocal contributor excels in reminding us that while two-hand dramas like Fall to Earth can represent a welcome treat from time to time, Big Finish’s real talents tend to lie in utilizing the traditional full-cast audio drama format of their releases to their immense advantage, with each character receiving their own tangible arc whilst not impeaching on Gwen and Rhys’ remarkably substantial individual development to any detrimental extent. As we reach the halfway point of Big Finish’s first season of Torchwood adventures, then, where do the studio currently stand in terms of the success with which they’ve resurrected the famed Doctor Who spin-off? Well, if The Conspiracy, Fall to Earth and now Forgotten Lives are indicative of the attention to detail that James Goss and company are aiming to continually pay in terms of offering the show’s leads new and occasionally audacious territory to explore, hunting down a wide array of supporting players who are more than capable of matching the series’ central cast for charm and memorability and devising progressive storylines which move the programme’s mythology as far from the detrimental constraints of the Miracle arc as humanly possible, then the light at the end of the tunnel which emerged four years after the series’ cancellation with the announcement of its audio revival should only grow brighter in the months ahead. That said, whilst the latter release’s commitment to furthering the overarching plot of Season One marks a refreshing departure from most audio series’ tendencies to hold back on substantial developments until their concluding chapters, it’s difficult not to hope that should Reeves be invited back for next year’s March-August run, she’s afforded the opportunity to leave her mark on Torchwood history not by producing an arc-dependent script but instead a captivating standalone effort in its own right, since despite its unique setting, Forgotten Lives ultimately feels too tied to both the show’s past and future to be regarded as anything but an above-average piece of connective tissue at best. 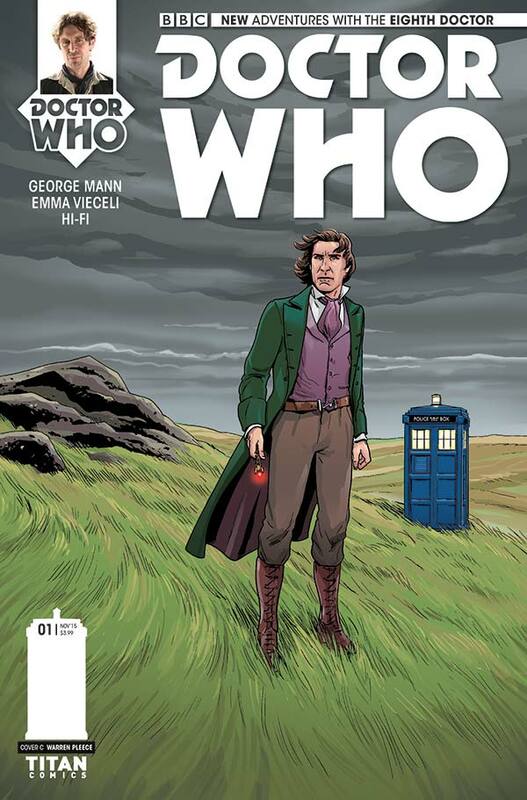 This latest original story from the ever-growing Titan creative collective brings in yet another new companion for the evergreen Eighth Doctor. How they meet is something of a bizarre coincidence as the Doctor has a legitimate reason for being there as the official owner, but Miss Josie Day is the actual resident at this point in time. The Doctor is on a hunt for a particular book, but cannot help noticing the remarkable, if somewhat alternative, paintings that litter the house. And things soon take a turn for the worse as the monstrous subjects that occupy the paintings leave the frames and assume corporeal form in the Welsh village surroundings. What they intend to do with the people living there that they round up is not clear, but the twin hearted Gallifreyan with a blue box must add his own dash of artistic inspiration in order to achieve a good outcome. 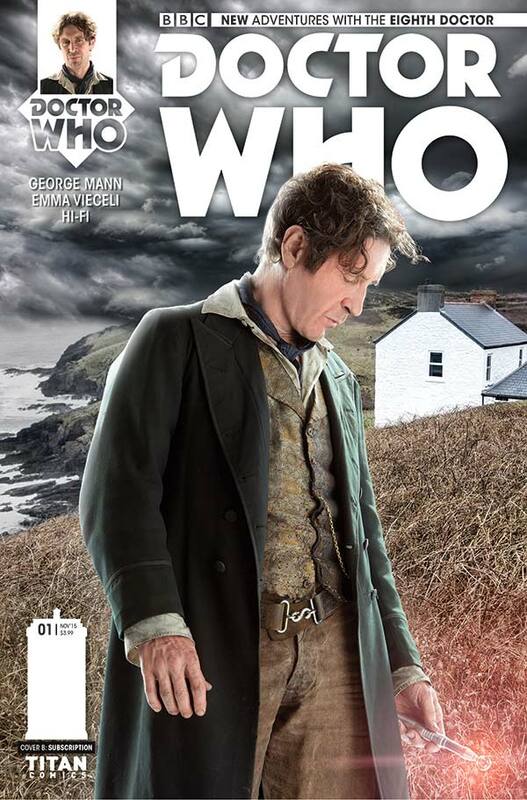 So many spin-off products have featured the Eighth Doctor, as well as the official Doctor Who magazine comic adventures for a good number of years. Yet it feels like this Doctor is still relatively unexplored, owing to two fleeting appearances onscreen by Paul McGann in 1996 and 2013. His is one of the more romantic and easy going Doctors, who faces danger head-on but likes to give his companions a role to play as well, rather than being the most patriarchal of regenerations. The approach for this new mini series is that of closely linked issues that can function as stand-alone but reward sequential reading due to the underlying mysteries and main plot involved. 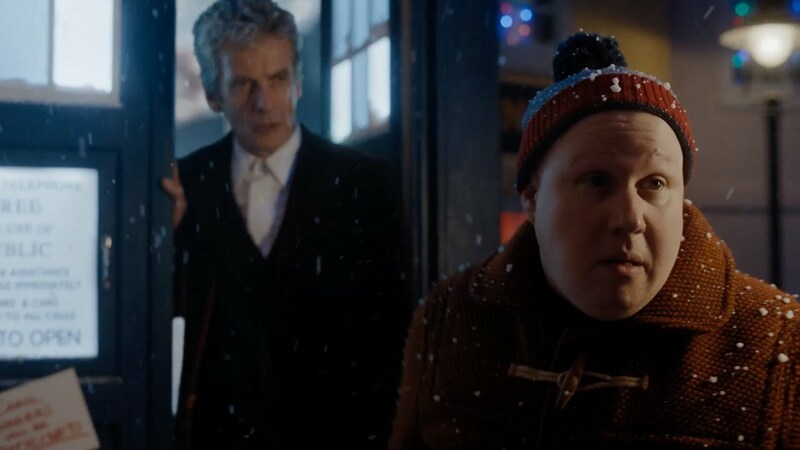 Considering the recent mini-series we have had, this is a welcome change in tact, although this opening segment on its own is somewhat low-key; presumably so the other adventures further afield take on rather more life. Artwork is very impressive here, with perhaps the odd panel of the Eighth Doctor being a little too unlike the McGann 'look'. But all the other original characters and monsters involved look great and the colours and backgrounds are done most effectively to breathe live into this opening story with somewhat of a laidback tempo. And pleasingly. a distinct anime style of art is used, which makes this mini series even more identifiable than the excellent Ninth Doctor collection (recently announced as becoming a fully-fledged monthly series next year). My personal nostalgia has a real link to Anime (and Manga films) goes back even further in my formative memories than Doctor Who itself. The style really fits, and makes reading this issue in one sitting the very antithesis of an unenviable chore. The original monster, dubbed 'Witherkin' are of some mild interest but due to their ponderous sheep-herding plan make a rather diluted impression. Writer George Mann is keen to give readers some continuity to enjoy by putting Ice Warriors and Krotons in the group of living paintings as well, but they strangely seem to be overlooked in the sense of how the Doctor responds to their unleashing. Mann also provides some links concerning other versions of the title hero. There is a reference to the previously released Twelfth Doctor Issue 12, which had the Doctor encountering a remarkable woman, especially for that era in human history. We also get some references by this incumbent Doctor to the Third incarnation, which perhaps surprisingly are not the most positive in spirit as the Paul McGann version does have some definite things in common with the much-loved Jon Pertwee one. I still think this mini series can (and will) pick up a gear or two, but as an example of an opener to a new series this comic is comfortable astute in its confidence and sense of meeting objectives. No new strips feature this time but some alternate cover are on show.